Flowers are put into Church every week, we have a good rota of flower arrangers, the names which are put onto a calendar at an appropriate date, the calendar has space for anyone who would like to donate the flowers, by adding their name, for any special reason ie, birthdays, anniversaries, memorial, if you would like an arranger to do the flowers for you, we would be very pleased to do so. 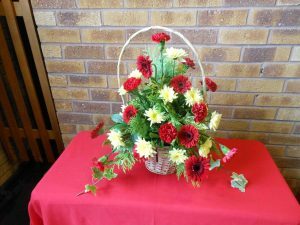 We also have another calendar which is also on the Flower Ministry notice board, this rota is for teams of 2 persons, who give the flowers out on a Sunday, usually after the Sunday morning service. If you would like to join either of these rotas, Sandra Townsend would be happy to add you name, and if you would like to donate for any Sunday flowers, Gill Oldham would be pleased to accept any monies.